Bionics designer Hugh Herr spoke today on the TED stage about a future in which disability is a mere memory – a future he believes is both imminent and imperative. With pant legs cropped to reveal his own two bionic legs (“I made sure to shave today,” he joked), he explained the fascinating details of his work in the Biomechatronics Group at the MIT Media Lab. But his weren’t the only high-tech prosthetic limbs on display: Hugh Herr: The new bionics that let us run, climb and dance At the end of Herr’s talk, Adrianne Haslet-Davis, a dancer who lost her leg in the 2013 Boston Marathon bombing, stepped onto stage for her first dance since the tragedy. Her bionic, embedded with the “fundamentals of dance,” was created specially by Herr’s lab to rumba. We spoke to Herr on the phone last week to talk more about the flaws in our technology, his collaboration with Haslet-Davis, and the bionic powers of the smartphone. What are some of the most exciting advances going on at the Biomechatronics Group? The group develops the science and technology behind extreme interfaces, between humans and synthetic devices. There’s a number of types of such interfaces. 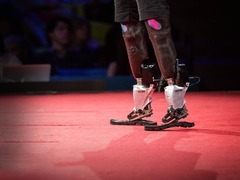 One is dynamic: How does the bionic limb move like flesh and bone? The second is mechanical: How does the bionic limb attach to the body in a comfortable manner? And third is the electrical: How does the bionic limb communicate with the nervous system? We’re trying to understand how synthetic devices, even shoes, can attach to the human body in a comfortable manner. We’re trying to understand how to link to nerves to communicate motor information and sensory feedback out of and into the nervous system, and we continue to build exoskeletal and prosthetic synthetic limbs that augment human physicality. How often do you interact with the people who are using your technologies? Are you in constant communication, or more behind the scenes? I wear two hats. One hat is I’m a professor at MIT and I direct a lab within the MIT Media Lab. So there we do the fundamental science behind the bionic structures that we develop, and there we sometimes bring patients in for the precise evaluation. But I also have a company that I founded called BiOM, which produces bionic leg devices. The first product is a bionic ankle-foot program that’s been fit for nearly 1,000 people, 400 of which have been injured soldiers. So I sometimes interact with the end user. In my opinion, it’s too infrequent. I’d like it to be more. But it’s fun when you fit a bionic device and you fundamentally change a person’s life. That’s a beautiful thing to witness. What’s the best or most memorable piece of feedback you’ve gotten from an end user? We’re entering an era of human history where we’re fundamentally changing in some realm of human tool use. So it’s interesting, when we fit a bionic appendage to a human, the comments that we often get are, “You’ve given me my body back. You’ve given me my limb back.” And when I pick up a hammer, I don’t have that reaction. So it’s an integration with technology that extends beyond mere tool use. So is that the ultimate goal of all tool use? Do you hope someday you pick up a hammer and you do feel that way? I think as we progress into this century, we will more fully understand how the human body and mind work, we will deeply understand who we are and what we’re made of, and we will more and more embed those principles and materials into the built world. Today’s technology too often is very crude. It doesn’t reflect fundamentally who we are. Technology often requires a user manual, for God’s sakes. So couldn’t we imagine technology that’s so seamless it’s like you and I interacting, or even a much deeper level of communication? And the answer is yes, we could imagine that. When you’re relating to end users, do you ever talk to them about your own experience, or are you only the scientist when you’re looking from that perspective? My scientific mind and my unusual body and the fact that I’m a user of bionic limbs are all integrated into one. So I never step out of my own personal experience as a user. It’s very effective as a designer of bionic devices to be a user of bionic devices. I understand the importance of good design, because when there’s bad design put out in the world, it creates a profound level of human suffering. If I’m able to test prototypes that we’ve built and fashioned, I can often quickly determine what’s wrong with the device. I’m very excited to see Adrianne Haslet-Davis perform with you onstage. What’s the history there between the two of you? I gave a lecture at Spaulding Rehabilitation Hospital, and many of the persons who lost limbs in the Boston terrorist attack were in attendance. I gave an overview of what’s possible today with bionics and what could be possible in the coming decades. Adrianne was in the audience with her parents. Shortly after that first meeting, I came up with the project of helping Adrianne return to the dance floor by putting together a team of MIT researchers that would design a specialized bionic limb for dance. That started this long and glorious technologic effort, working closely with dancers with biological limbs, working closely with Adrianne, of course, and working closely with persons trained in many areas of technology to get the job done. And do you think that you as a climber relate to her as a dancer? Do you see any kind of athlete-to-athlete connection? I do, because there’s interesting parallels. Before my biological legs were amputated, my life’s passion was the vertical world of rock and ice climbing. You can compare climbing to a vertical dance. And Adrianne, before the Boston terrorist attack, her life was and still is dance. So we both had this extraordinary passion. We both suffered limb loss and returned to our chosen activity using the vehicle of technology. Were you in Boston for that attack last year? I was actually in Spain. What was it like coming back to that? I was hearing reports from students trapped within the MIT Media Lab for a very long time. The MIT officer that was shot and killed was just a few hundred feet from my lab. The people who were already in the building were asked not to leave the building. So I was hearing all these reports—MIT officer down, carjacking, bombs being exploded in the Boston area—and at first I didn’t think it was real. Sadly, it was real, but I’m very proud of Bostonians. The city showed its strength and character throughout the whole entire ordeal. In your TEDMED talk, you focused on representations of both physical and mental disability. What potential do you see for bionic enhancements of our mental capabilities? At the MIT Media Lab, we’ve established the Center for Extreme Bionics, and one of my collaborators on the center is Professor Edward Boyden. Ed focuses on getting information in and out of the brain, as well as strategies for mapping the brain. So there’s an exciting science and technology story that’s evolving – when there is a brain condition, how to apply electrical and sometimes chemical interventions to mitigate the issue. In the last several decades, there’s been studies done on deep-brain stimulation, where artificial electrical pulses are applied to regions of the brain to mitigate or eliminate tremors, and to even mitigate depression. Right now in history, to treat something like a mood disorder, we’re approaching it with a pharmacological approach. We’re doping this very complex computer with a chemical that lacks specificity, and there’s unfavorable side effects. We can imagine a future where the intervention is more focused, with higher specificity, and we can actually target brain cell types that we wish to target – and not target cell types that do not have a pathology. So there’s a whole science evolving on how to reengineer the human brain. An exciting area is an emerging field called optogenetics, where light is used to turn on and off different cell types in the brain. Do you think even something like the autocorrect that we use in text messaging counts as a mental bionic? Sure. And it’s a physical bionic, because when it works, which is not all the time, it increases the speed with which we can communicate with our thumbs. If you think about it, augmentation technologies are just completely pervasive throughout society. We often don’t think of our technology as augmentative because we’re so accustomed to it, but a smartphone is an extraordinary augmentation for our bodies and minds. What is your dream for the future of this? What can’t bionics do now that you hope someday it will be able to do? One day I hope to be able to have sensory feeling of my synthetic bionic limb. One day I hope to have a balance that’s perhaps even superior to normal human balance. With current technology, I can today walk at normal speeds with normal metabolic energies, which is a huge triumph. I hope to walk one day and never experience pain, and I wish that for about 20 million persons that use prostheses throughout this planet. The profound legacy of bionics will be the elimination of disability, and I believe it will happen in this century. And that goal is obviously good for the individual with a disability, but it’s also good for economic cost. The fact that we have such poor technology today and such rampant human disability is very costly to society, a trillion plus globally. So it’s not only a human story, it’s a deeply profound economic story. Editor’s note: At the end of his TED Talk, Herr mentions he’ll be speaking to the Centers for Medicare & Medicaid Services (CMS) about funding prosthetics. For more information, read this press release. This was such an impactful moment from the conference. A key take away was the statement that people are not/cannot be broken, that our environment and technology are the ones that are broken, they need fixing. All of us have a basic right to a human experience, so technology and our environments must be shaped to make everyone’s human experience the best possible. Reblogged this on HEROES NATION BLOG by Joseph Pellerito Jr..